NATIONAL BESTSELLERThe three Great Premises of Idiot America:· Any theory is valid if it sells books, soaks up ratings, or otherwise moves units· Anything can be true if someone says it loudly enough· Fact is that which enough people believe. Truth is determined by how fervently they believe it With his trademark wit and insight, veteran journalist Charles Pierce delivers a gut-wrenching, side-splitting lament about the glorification of ignorance in the United States. Pierce asks how a country founded on intellectual curiosity has somehow deteriorated into a nation of simpletons more apt to vote for an American Idol contestant than a presidential candidate. But his thunderous denunciation is also a secret call to action, as he hopes that somehow, being intelligent will stop being a stigma, and that pinheads will once again be pitied, not celebrated. 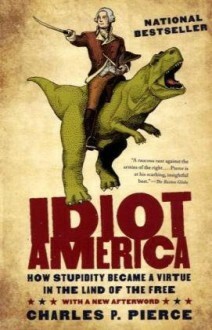 Erudite and razor-sharp, Idiot America is at once an invigorating history lesson, a cutting cultural critique, and a bullish appeal to our smarter selves. Got the message. No need to repeat it. Agreed on all points. Simply not entertained enough to continue. Dnf at 19% (kindle edition).